The Seven Years’ War (1756–1763) has been termed a time of transition between the ancien régime and modernity. The chapter draws attention to the shift from local patriotism to a kind of proto-nationalism, new images of heroic sacrifice and the making of a bourgeois public sphere. New patterns of articulation emerged that widened the spectrum of battlefield emotions by connecting it to a hybrid emotional regime that included religious, patriotic but also epistemic patterns. The new emotional practices originated in media change, charismatic figures and material culture. 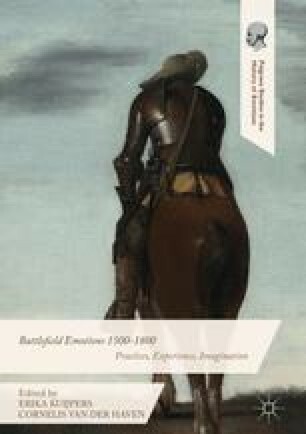 By linking the emotions of war with the media as well as the consumer revolution of the eighteenth century Füssel explores new practices of participation and commercialisation of feeling.